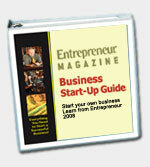 BusinessMart.com strongly recommends Entrepreneur Magazine's Hair Salon Start-Up Guide. For more information read below. To purchase this book click on BUY NOW. Succeed with style! Hair salons and day spas across the country are making as much as $300,000 a year ï¿½ and you can, too. Whether you want to start a small salon out of your home or open a full-service day spa, this guide will show you exactly how to succeed. An overview of the hair salon/day spa industry with answers to commonly asked questions. Youï¿½ll also get inside information and invaluable advice from industry professionals as they reveal how theyï¿½ve been successful in this lucrative business and, more important, how you can be successful, too. Attractive hair, newfound energy and a revitalized appearance are always in style, no matter what ups and downs await the economy. Order your guide today and get started on the path to success!